Nesse episódio do podcast Inglês Online falamos sobre uma maneira simples de expandir nossa comunicação em inglês. Hello, all. Today we have a new episode of the inglesonline podcast. To download or just listen to other episodes and download transcripts, go to inglesonline.com.br and click Podcast Inglesonline. I saw a dog in the yard. That woman is from Germany. People say Mr. Jones is a great teacher. Did you see those people? Short and simple, right? Here they are again, said a bit faster: I saw a dog in the yard. The crowd was noisy. That woman is from Germany. People say Mr. Jones is a great teacher. Did you see those people? So there’s absolutely nothing wrong with them, and as you and I both know, what people say is frequently longer and more detailed. So how about we take a look at one of the ways we can pack more information into those sentences? Take the first example: I saw a dog in the yard. OK, that’s fine. However, when I looked at the dog, he was doing something. Yeah, I said “he” because… I could see it was a boy, so to speak. A male dog. 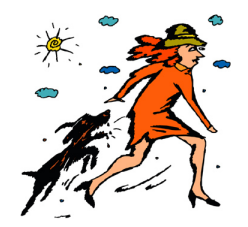 So what I noticed when I saw the dog was that… he was barking at Sally. Sally is someone I know, and she was standing next to the dog. And the dog was barking at her. Remember my initial sentence? It was ‘I saw a dog in the yard’. And it was barking at Sally. What I would probably say in a real conversation is I saw a dog barking at Sally in the yard. The additional information here is “barking at Sally”, right? And that’s pretty much the same thing we do in Portuguese. You don’t want to simply communicate you saw a dog. You want to communicate that you saw a dog barking at Sally. And, of course, instead of saying two sentences, such as “I saw a dog. It was barking at Sally”, we go for the easy way… We combine them into one sentence: I saw a dog barking at Sally in the yard. What about the second one? The crowd was noisy. What crowd am I talking about? Well, I was driving by a theater last night and got stuck in a bit of a jam. It was right at that moment that the crowd inside the theater was coming out to the street, and they were really noisy. They were talking and laughing and I thought they were really noisy. So what I’m telling you is that “The crowd was noisy”. Which crowd? The crowd coming out of the theater. So what I would probably say is The crowd coming out of the theater was noisy. Let me call your attention again to the simple version of this example: The crowd was noisy. What’s the subject in this sentence? “The crowd”. Now the longer version is “The crowd coming out of the theater was noisy. What’s the subject here? The subject here is “The crowd coming out of the theater”. What was noisy? The crowd coming out of the theater. Moving on… ‘That woman is from Germany’. Here’s some more information about this woman: she is talking to my sister, and for whatever reason I think that that piece of information is very relevant to the story I’m telling you. So what I would say in reality is not “That woman is from Germany. She is talking to my sister”. I would say “That woman talking to my sister is from Germany”. Now, I know this is relatively easy to understand, and exercises about this in your English book aren’t that difficult either. But are you talking this way, though? If you’re not yet using this kind of structure in your conversation, then this topic isn’t too easy for you. Here’s the fourth example: People say Mr. Jones is a great teacher. What people are these? The people who are taking the course… some course. So the people taking the course say Mr. Jones is a great teacher. People taking the course say Mr. Jones is a great teacher. My last example is a question: Did you see those people? So now I’m going to be more specific: Did you see those people yelling outside the restaurant? There were some people yelling outside the restaurant and I’m asking you if you saw them. Did you see those people yelling outside the restaurant? It’s all about being more specific and providing more detail to what we’re communicating. Let me tell you a few things about my morning. The girl sitting next to me talked on her mobile for hours. The guy serving coffee was wearing a baseball cap. People walking in the street looked rushed. The guy working in his computer kept silent. The woman wearing a black suit didn’t have anything to drink. So what can you tell us about your morning? Let us know in the comments. Talk to you next time. Pessoal, adorei os comentários… bacana colocar em prática com nossos próprios exemplos, não? this website is just the most amazing website to learn english that i’ve seen! It’squite hard to find a tool like your website which teach us the real spoken english used by the native speakers. How can I download the podcast? When i try to do this on that link “Baixe o mp3”, open up a new window here, not the file “.mp3”. Is this correct? You are such a good teacher! congrats! Excuse-me, Ana, but I need to tell you something: I love listening your podcast!!!!!! Hello Ana Luiza, I love your podcasts, but I can’t do podcasts download to my computer, I don’t know why. Can you help me? I only hear the mp3 podcast on inglesonline.com.br, but I would like do the download. In this morning I was feeding my daughter when it started a torrential rain. Thank you Very much for all tips! I really dunno what I would do without Inglês Online !!! I saw some kids playing on the street this morning. They were singing and laughing as if it wasn’t 7 AM. In this morning I saw a man walking in the street without shoes. He was leaving a slum near of my house. Hello all, thankful by this post, Ana. This morning I was creating a report to my boss. I like to create projects and invent something else, but I don’t like to release it before a good review. There are some coworkers that didn’t have breakfast, that’s why I see someones having bread with butter in your office often. I take a look every morning at the emails, but I don’t like to answer clients over theirs most doubts about our price’s products. So, let’s see if I could get it right! That while we provide some information about someone or something doing/making some action: should we use ING to specify that action? = ING Clauses? I’m happy , because I could understand everything you said without looking at the text..
Obrigada por estar sempre com novos assuntos e tópicos.